Physics Buzz: Oh the wonder of stuff! I remember when Nickelodeon went through its materials phase and came out with Gak, Floam, Smud, Squand and Gooze; a joyous variety of moldable materials that brought mayhem to carpet everywhere. These substances probably inspired more than a few young sculptors and materials physicists. Here are a some great new developments in materials physics that actually serve a purpose beyond entertaining 12-year-olds. Because it’s a metal, scientists can manipulate its shape using magnetic fields, or just the traditional method of smashing it. Scientists hope the foam can be used in tiny motion control devices, space born applications, or in mechanical devices without mechanical parts. Kind of like the ghost in the machine, don’t you think? By turning on a magnetic field the foam will change shape. Once the field is turned off, the metal maintains its new shape. To get it to start reforming to it’s original shape, simply rotate it 90 degrees. If you’re not familiar with the properties of a magnetic field, this seems like an odd thing to do to make a metal foam start reforming itself to its original shape. But imagine turning a magnet 90 degrees with respect to its poles: you’ll have one end that attracts metal suddenly replaced by the end that repels it. Those 90 degrees reverse the direction of the polarity and cause the foam to reshape itself. 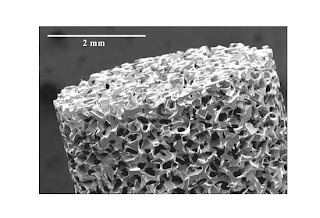 The researchers created the new material by pouring molten alloy into a piece of porous sodium aluminate salt. Once the material cooled, they leached out the salt with acid, leaving behind large voids, hence the foam structure.